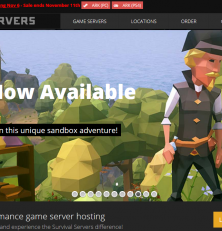 Survival Servers was started in August 2012 by two friends. As one of the original hosting providers for the original ARMA 2: Operation Arrowhead mod “DayZ,” (the obsession that started it all) Survival Servers quickly became a known brand due to the competitive pricing and full-fledged feature set of their custom DayZ Tools, Private Hive scripts, and easy integrations with other popular Arma 2 mods. Having tried their 7 Days to Die server for some time now, I have to say their server wasn’t up to par. We started with a server in New York, and for some weird reason they moved it to France. After requesting it be returned to New York, we had seen lag spikes and freezing as well as very slow world rendering even with 3/12 slots used. Server crashed several times a day and we couldn’t restart the game server because the entire server crashed for hours at a time. For their game server prices, we found they were all over compared to other providers but leaned on the more expensive side. Support is very slow and lacking in knowledge to fix the issues that repeated day after day. I have to at this time rate them fairly low from our experience and we can’t say we favor their services.